The BDH cash transfer is a social protection program directed to the poorest households in Ecua-dor. This paper examines its impacts on attendance, cognitive and non-cognitive outcomes of stu-dents that aim to pursue higher education. The data used corresponds to the Ser Bachiller data base and the Associated Factors Survey for the academic cycle 2016-2017 (one cross-sectional period). The short-term exposure to the program was evaluated building a pseudo-assignation index and a regression discontinuity design (RDD). The main results show that households that are near the assignation score (28.2) have an increased probability of participating in the program that ranges from 7.5 to 8.6 percentage points. The BDH has a positive and significant impact on school at-tendance of around 0.40 percentage points. 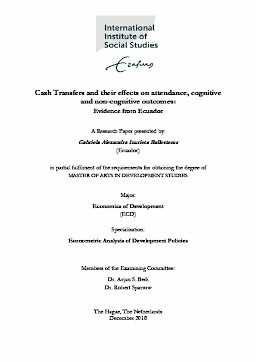 For the cognitive outcomes, RDD-IV estimates reveal that the BDH cash transfer has a statistically significant negative effect on the general score that ranges from -0.34 to -0.35 points. The effect is also negative and significant for the mathematics score: a decrease of 0.37 to 0.44 points. For sciences score the effect is of -0.49 points. Regarding the non-cognitive outcomes, the BDH has a negative impact on students’ academic self-esteem in mathematics - that ranges from 0.23 to 0.26 percentage points and a negative effect on academic self-esteem in language class ranging from 0.29 to 0.33 percentage points. The overall results indi-cate that even though the BDH motivates attendance, the effect is not translated into higher scores or better students’ expectations, motivations or self-esteem.